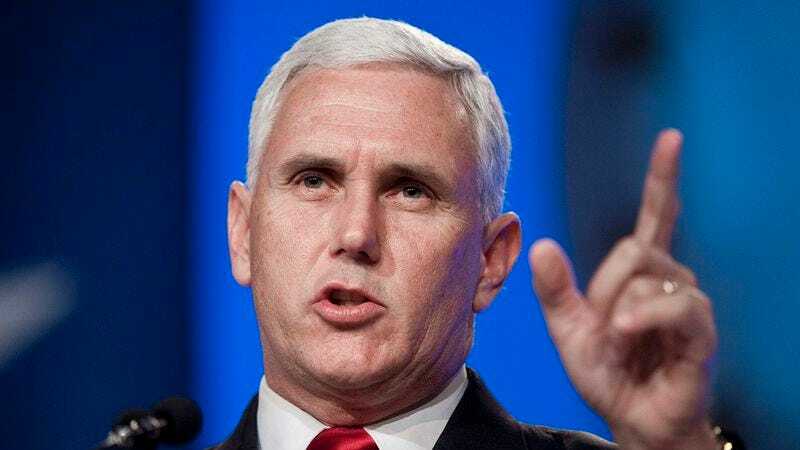 INDIANAPOLIS—Addressing the controversy surrounding his state’s recently signed Religious Freedom Restoration Act, Indiana governor Mike Pence forcefully insisted to reporters Monday that the new law has nothing at all to do with what it was explicitly intended to do. “Let me state directly that in no way is this law designed to allow the kind of anti-gay discrimination that is the law’s single reason for existing,” said Pence, emphasizing that provisions authorizing businesses to refuse service to gay customers were nothing more than the only explanation for the law being drafted in the first place. “Regardless of the widespread misconceptions surrounding it, I want to reassure Hoosiers of all backgrounds that this law will never be interpreted in the way it was unambiguously designed to be from the very beginning.” Pence further clarified that the act’s sole purpose was in fact to safeguard the free exercise of religion it was in no way whatsoever created to protect.